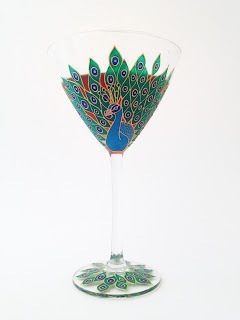 Over the last couple of weeks, I've been painting peacocks; peacocks on champagne flutes, peacocks on mirrors and of course, peacocks on cocktail glasses. Peacocks have long been a great love of mine and indeed, I previously dedicated a whole post to them, so enamoured am I of their beauty. If you would like to read that, then please click here. However, today's post is all about the cocktails and for all three, I am using Martin Miller Gin, which, as I mentioned in my Taste of London post, is a damn fine gin. So fine in fact, that Mr TG, who has never been a great fan of the stuff, has been won round to it's fresh, clear, citrus magnificence. In celebration of it's wonderful gininess (if I say it's a word, it's a word), I have made three, great, gin cocktails and shown them off in the same Peacock glasses, but all to very different effect. The first cocktail is a classic Martinez, whose history is a little hazy, but is thought to be a precursor to the Martini or even a variation of it. Indeed, there are theories that it may even have been a gin version of a Manhattan. To be honest, nobody knows for sure, but most can agree that a modern Martinez will have one part gin to two parts sweet vermouth, with a little splash of maraschino liqueur or perhaps even triple sec and a dash of bitters. The addition of orange zest is often used too, although not a prerequisite and I have chosen to leave it out of the glass as there would be too much going on, with such an intricate design. However, in a plain martini glass, it does look nice against the cocktail. The Martinez is a very simple cocktail that requires good ingredients to make it shine which is why Martin Miller Gin is perfect. I generally prefer cocktails with more citrus or berry fruit, but the sweetness from the vermouth and the maraschino, alongside the spice and the herbal notes combine with the gin's botanicals to make a complex and surprisingly quaffable drink. Add all of the ingredients to a bar glass or the bottom of a shaker, with some ice. Stir the drink for 20 seconds to fully mix the cocktail and to get the correct viscosity and temperature. This next cocktail, the Southside has an equally hazy history, with some claiming it dates back to the Prohibition and refers to the Southside district of Chicago Illinois. Others claim it was created at the 21 Club in New York City. Recipes also vary, from serving it as a mojito style drink over ice, with bitters or as I have done, shaken up and served in a martini glass. Whatever the history and however you serve it, it's a refreshing combination of lemon, mint and gin, which makes it just about perfect in my opinion. Add all of the ingredients to a cocktail shaker with ice. 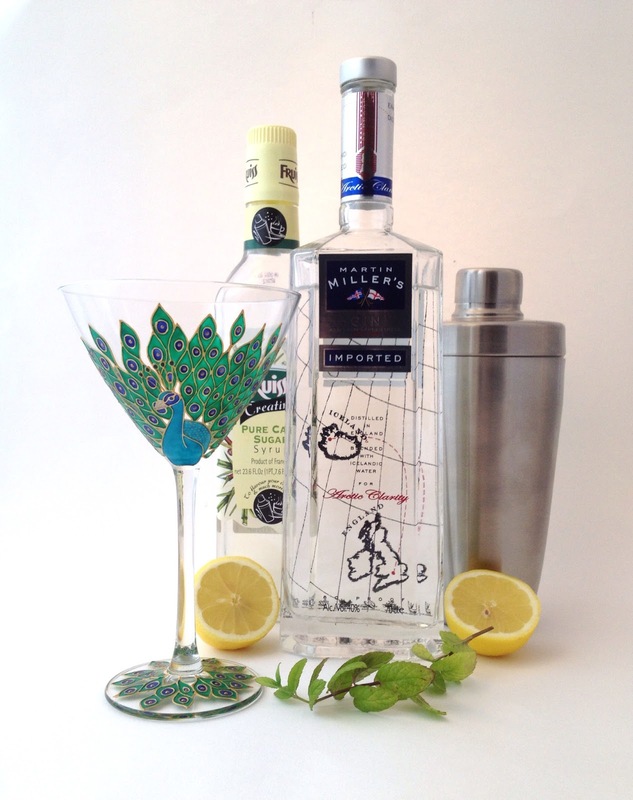 Shake hard for 20 seconds and then double strain into a chilled martini glass. 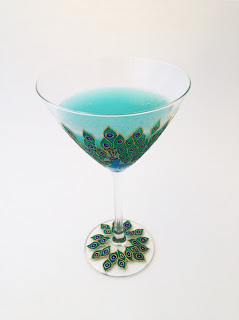 Finally, we have a variation on the Pegu, a cocktail made famous by the Pegu Club in Rangoon, a colonial hangout and listed in the Savoy Cocktail Book of 1930. It is a combination of gin, cointreau, lime juice and bitters and has an almost grapefruit flavour. My version uses blue curacao in place of cointreau, which gives it a blue colour, but doesn't alter the flavour too much. 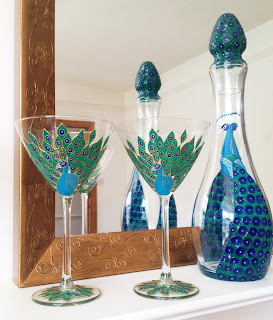 It's refreshing and perfect for these glasses I think, with it's peacock hue. 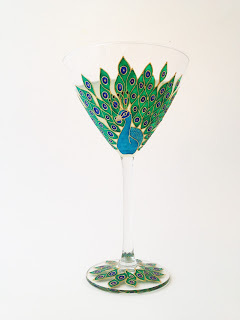 Remember, if there are any cocktail terms that you don't understand, they should all be explained in this post, the Dufford's Guide and if you would like to read all about the fabulousness of Peacocks, click here.